The Drop-A-Rock 5-Climber was created for those who need high capacity. Busy theme parks, family entertainment centers, trampoline parks and others will appreciate the ability to accommodate 100 climbers per hour. The Drop-A-Rock has an engineered steel frame with a weather resistant powder coat finish and solid fiberglass climbing surface. Generally speaking it is a half-round shape that is open on the back where a compact brace kit provides additional stability and the auto belays are installed. It ships as a prefabricated structure for simplified installation in around 4-6 hours. It’s a freestanding design that permanently attaches to a concrete foundation using mechanical wedge anchor bolts for indoor or outdoor installation. This is commercial grade quality at its finest! 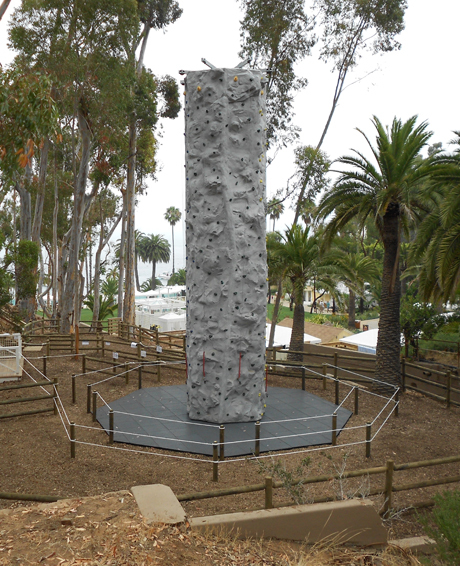 The Drop-A-Rock has 5 Auto-Belays preinstalled for unparalleled safety protection. Our Auto-Belay is an advanced hydraulic / pneumatic system that automatically lowers climbers when they let go of the climbing wall. It adjusts for the climber’s weight as long as they are between 40 to 250 lbs (18-113kg) to provide a slow and safe ride back to the ground. Our Quick Harness is a true one-size-fits-all adjusting from 18-48in (45-122cm) waists. With the snap of 3 parachute buckles you are ready to climb. Connect the climber to the safety line and the climbing wall does the rest for you! Spectrum Sports is the preferred climbing tower supplier in the amusement industry. We build rock walls for amusement parks, camps, schools, large FEC chains, and independent leisure locations around the world.